TriAttic - News: What a year 2013 was for Triattic! What a year 2013 was for Triattic! 2013 was a special year for Triattic. First time triathletes, new PR's, first time Ironman athletes and much much more. We had the addition of three USAT Certified coaches, Charlie Johnson, Jo Curry and Stephanie Liles-Weyant. This allowed us to take on more athletes and help more people achieve dreams, goals and aspirations. 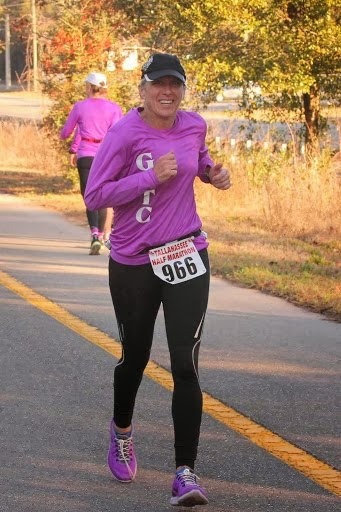 The year started off with a bang at the Tallahassee Marathon and Half Marathon. Ron and Michelle Harrison finished their first marathon together in a time of 4:33:38 (ahead of goal time!!) and Alison Thumm set a new PR running 26.2 miles in 3:44:37. 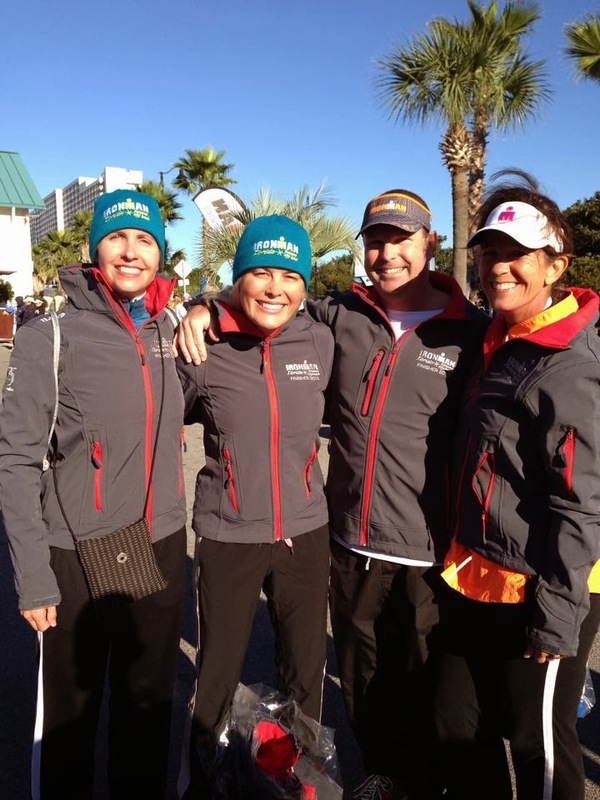 Laura Register, Natalie Radford, Robby Turner and Melissa Thompson ran the half marathon. Melissa set a new PR and went on to finish 3rd overall female with a time of 1:29:15. This year Triattic got to host three first timers clinics for Red Hills Triathlon. Many of the coaches and team member were out on some chilly mornings helping more than 30 athletes to the finish line of their first triathlon. Thanks coaches and team for the support at this local event! Triattic had a total of 29 athletes and coaches compete at Red Hills Triathlon. This is one of the teams largest races of the year. It is a great local event that also serves as a GWTC Grand Prix race. Coaches Charlie and Sandy both took 3rd overall in the perspective genders. We had top five AG finishes from Melissa Thompson, Keith Rowe, Marty Hufstetler, Hilary Joyner, Michelle Harrison, Monica McCullion, Windell Kjono and Bob Keller! This was the 30th anniversary of St. Anthony's Triathlon. 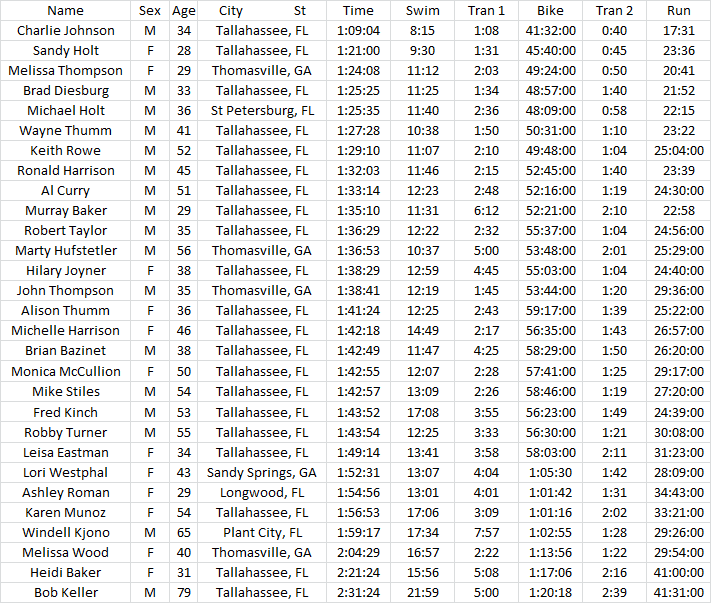 It is the USAT Florida Region Championship and HyVee 5150 qualifier. Triattic had 11 athletes, three who were competing in their first Olympic Triathlon. Way to go Ron and Michelle Harrison and Brad Taylor for finishing your first Olympic distance triathlon. Melissa Thompson went on to take 5th place in Female 25-29 with a time of 2:15:58 and qualified for both the USAT Age Group championship and HyVee 5150 Championship. Over the summer and throughout the year members of the team were seen at Ironman 70.3 New Orleans, Ironman 70.3 Haines City, Ironman Texas, Jacksonvillle Triathlon Series, Beach Blast Triathlon, Ironman Coeur d'Alene, Georgia Veterans Triathlon, Fort Ruckers Triathlon, Chattahoochee Challenge, Tri the Rez, Beaches to Battleship and many more. 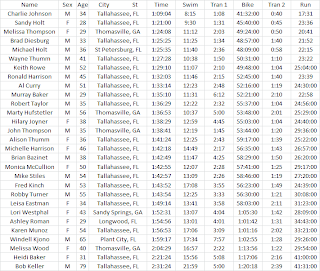 Triattic had two first timers and one coach competing in Ironman Lousiville. First time Ironman athletes were Marty Hufstetler and Tony Roelofs and coach Sandy was taking on her 11th Ironman. Congratulations to Tony and Marty who crossed the finish line together in a time of 12:59:19. Sandy finished in 11:50:53 making this her 7th Ironman finish in one year. The next BIG "A"race for Triattic was Ironman 70.3 Augusta. Triattic had 17 athletes compete at Augusta this year, 8 returning athletes, 3 athletes new to the course and 6 first time Ironman 70.3 athletes. That is a total of 1,265.4 miles of racing from one team in one day. About the distance from Florida to New York. Way to go team! 8 returning athletes: Melissa Thompson (PR) - 4:55:11 (5:13:53 - 2012), Wayne Thumm (PR) - (5:26:05 - 2012), Marty Hufstetler (PR) - 5:29:46 (5:41:49 - 2012), Jo Curry (PR) - 5:44:08 (5:57:22 - 2012), Michael Holt - 5:32:24, Al Curry - 6:16:31, Leisa Eastman - 6:20:32, Natalie Radford (PR) - 6:36:42 (7:26:55 - 2012). 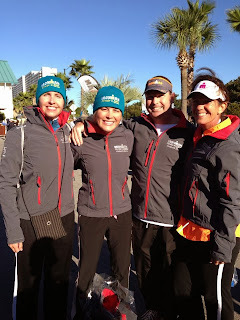 This year at Ironman Florida Triattic had 6 first time athletes toe the starting line and 6 athletes become Ironman!!! Brian Bazinet, Monica McCullion, Leisa Eastman, Hilary Joyner, Natalie Radford, and John Hunt "You are an Ironman"! Way to go each and every one of you. Training for an Ironman takes commitment and passion and all of you did such a wonderful job during training and it paid off for you on November 2, 2013! Other Notable achievements this year: Laura Register, Jo and Al Curry - Big Sur International Marathon finishers, Charlie Johnson - Ironman 70.3 World Championship finisher, Melissa Thompson - HyVee 5150 Championship Finisher, Brad Taylor - first time 70.3 finisher, Michelle Dahnke - first time 70.3 finisher, Kelly Garland - NYC Marathon finisher, Robby Turner - Palm Beach Marathon finisher. TriAttic helps you connect and live the endurance-multisports lifestyle by providing personalized coaching services, weekend group training sessions, clinics, group events, and access to world class products. Our mission is to provide clients the knowledge, skill sets, training, and confidence required to achieve their personal goals. The coaching programs we provide are based on the individual and created according to your experience, needs and lifestyle requirements.